Cool Tip: Truffles and Flourishes! It’s almost truffle season, when the wonderful earthy smell of fresh truffles can take almost any dish to the next level. But you don’t have to wait for truffle season or shell out a whole lot of money to have a little touch of that magic at home. We’re talking about truffle butter. True, it’s not the sublime taste of fresh truffles, but it will add a new highlight and take your dish up a notch with very little effort. We buy our truffle butter at Costco (they used to have it only at the holidays, but now they seem to stock it all year around). If you buy extra, or you’re not going to use it right away, then you can store it in the freezer (and scrape off what you need): it will spoil after a while if left in the refrigerator. You can indulge yourself and put it on popcorn, or melt a little in your scrambled eggs. A little goes a long way. We blanch fresh green beans from the garden and serve them topped with sea salt and just a little bit of truffle butter...heaven on a plate! 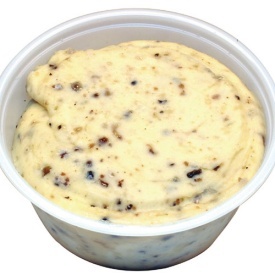 Does anyone have other great uses for truffle butter?